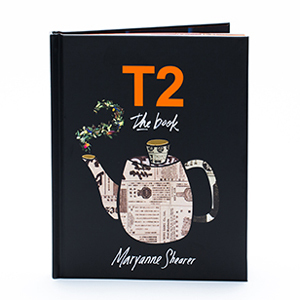 To call T2 The Book a ‘coffee’ table book might well be an insult, for T2 the brand has certainly lifted the profile of tea from the doilies-and-clotted-cream set to a funkier and more accessible product. Just like the brand, the book is well designed and nicely presented, which gives those with a passing interest in tea a glimpse into the world. Author and T2 founder Maryanne Shearer begins with T2’s origin story, how she and co-founder Jan O’Connor wanted to start a homewares business but ended up realising that tea was a better bet (in an interview with the AFR, Shearer reveals this was due to the threat of big names such as Country Road going into homewares but the book does not mention this). I’d actually picked up the book believing this to be its purpose but this was just the introduction. Instead, Shearer spends the rest of the book dancing from an introduction to tea—its history, as well as growing, processing and drinking it—to the culture of T2 and its growth, both its range of tea and teaware and the expansion of the business. In between there are a lot of fun spots, like ‘Matching tea with…’, which has a bunch of silly quizzes; for example, you look at a Rorschach blot and depending on what you see there is a suggestion of what tea you might like. 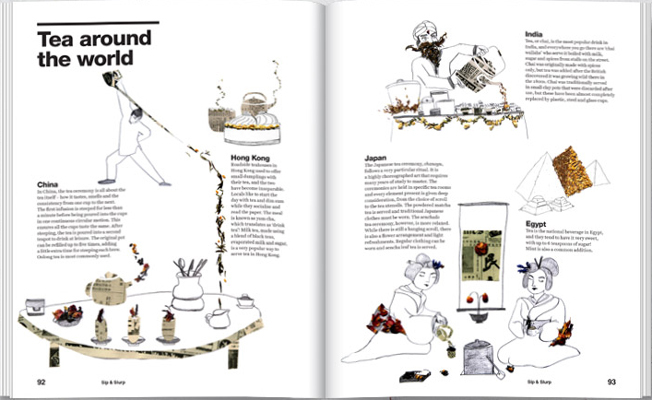 There are also interludes with snippets on ‘Tea around the world’ and some recipes where you can cook with tea. The fun illustrations and high quality photographs make this an easy tome to flick through. Beautiful as the book is, it was disappointing to see Shearer use ‘fermentation’ interchangeably with ‘oxidation’ when explaining the processing of tea (they are not the same thing), perpetuating a myth that separates first-rung tea enthusiasts from the true experts. I also felt the product placement was gratuitous. Yes, I know it’s called T2 The Book, but do we really need a whole chapter on the T2 range? We can get that in any store. There are also several pages devoted to T2 marketing campaigns and gushing about the T2 ‘family’ of staff, which tends to make the brand come off as a bit of a cult, which I don’t think the author intended. As a business phenomenon, T2 is certainly very interesting to me as it has done more to advance the general public’s knowledge of tea in the last couple of decades than any other brand in Australia. But the purpose of the book is less about education and more about what T2 stands for as a brand as well as a guide to the tea it sells. Still, it’s a nice primer for tea enthusiasts at the beginning of their tea journey and there’s no doubt it’ll turn up in many tea lovers’ Christmas stockings later this year. Verdict: A easy-to-read reference book for the T2 consumer, especially for those who love design as much as they love tea. For more advanced tea lovers who are not into T2, there’s not much to recommend as there are other tea books that are more informative. This entry was posted in books and tagged book, review, T2. Bookmark the permalink.